Technological advancements in AI and mechanics have led to a robotics boom in the last few years. We’re seeing an increased use of robots in everyday life, and especially in commercial uses. The topic is so prolific, even The Vatican is holding panels on the ethics of robots. From drones that film Oscar-winning shots, to warehouse robots that can select and organize inventory, to a pizza-delivering robot, automation is on everyone’s mind. While many of today’s robots function behind the scenes to make our lives easier, not everyone wants to keep this technology hidden behind the curtain. 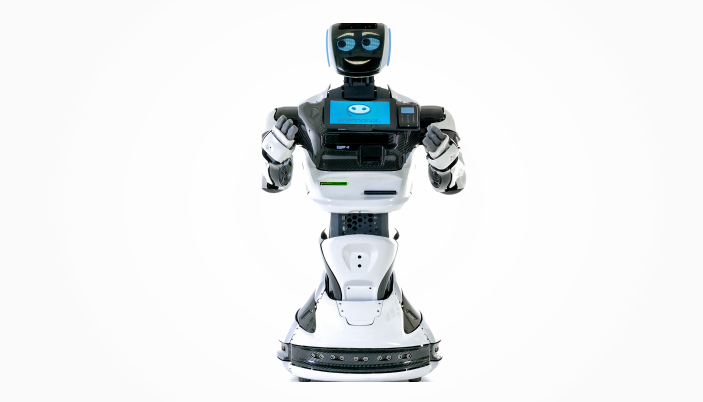 Enter Promobot, an autonomous service robot designed to be fully interactive and customizable. Founded by Oleg Kivokurtsev and Aleksei A. Iuzhakov in 2015, Promobot products use facial and voice recognition, speech synthesis, touch displays and analytical tools to successfully interact with and respond to humans. The technology has been recognized at many international competitions for its innovation, and its co-founder Kivokurtsev was recognized on Forbes’ 30 Under 30 list in 2016. Promobot was the Startup Village 2015 winner, and received widespread attention at CES in 2018 and 2019. With advanced AI-powered recognition and analytics software, Promobot can tailor its responses based on the determined age and speaking language, and can be programmed to move and react based on previously set criteria. Promobot also has the ability to “remember” faces and names, and data associated with previous interactions, which can be extremely valuable in a customer service setting. All this powerful technology is wrapped in a friendly, accessible design – an important factor when it comes to humans trusting robots. Science fiction has played a major role in our distrust of automated robotics. Promobot was designed specifically to encourage interaction without coming off as intimidating, with customizable facial expressions, a height-adjustable “body” and movable arms. Investing in a robot may not be top of mind when you think of ways to help businesses. Promobot can reduce labor costs and improve the consistency and quality of service, all while engaging consumers in a new, high-tech experience that makes a business stand out from its competitors. In areas with lots of foot traffic, like museums and conferences, this type of technology frees up employees to take care of important tasks instead of answering frequent questions about exhibits, giving directions or processing entry tickets. Promobot can easily handle those interactions without needing to be monitored. And the robot can do more than just customer service. Integrating with external systems and devices, Promobot can easily handle a wide range of functions. There are more than 400 Promobot products currently in use in more than 27 countries, in places like retail shops, airports, conferences and independent businesses.